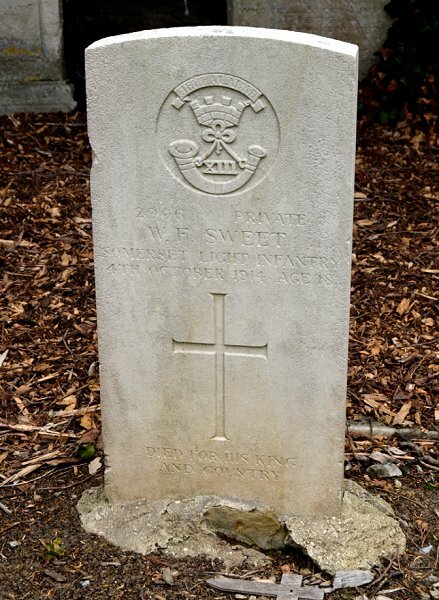 William Frank Sweet was born in Yeovil in the winter of 1897, the son of groom Richard Sweet (1861-1911) and his wife Mary Louisa née Bess (1856-1925). In the 1901 census Richard and Mary were listed living at 40 Higher Kingston with their children: Edward (b 1880), Selina (b 1882), Charles (b 1884), Walter (b 1889), Alice (b 1894) and 3-year old William. In the 1911 census the family were listed at 5 Higher Kingston (which may have been a different house or may have been the same house since much of Yeovil was re-numbered around this time). 13-year old William was listed as an errand boy for a tailor. He was later to start an apprenticeship at James B Petter's Nautilus Works. Almost as soon as war broke out William enlisted in the Territorials at Taunton (Service No 2906), joining the 5th (Service) Battalion of the Somerset Light Infantry. While training with the Battalion on Salisbury Plain William caught a cold which quickly developed into double pneumonia and he was hospitalised at Tidworth. He died in hospital on 4 October 1914. He was just sixteen years old. On 9 October 1914 the Western Gazette reported "Private William Frank Sweet, son of Mrs M Sweet, of 5 Higher Kingston, died on Sunday at Tidworth Hospital, of double pneumonia contracted from a cold. The deceased, who was nearly 17 years of age, was an apprentice at Messrs. Petters, and about a month ago joined the Territorials. And it was while on Salisbury Plain that he caught the cold. He received every attention. The body was brought to Yeovil by rail on Thursday." 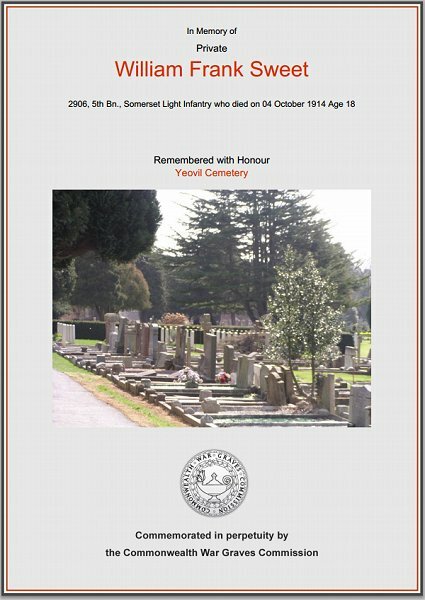 William was buried in Yeovil Cemetery, Grave A204, and his name is inscribed on the War Memorial in the Borough. 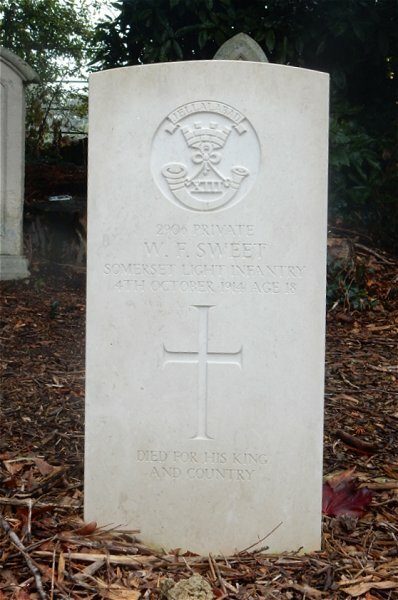 William's Commonwealth War Graves Commission headstone in Yeovil Cemetery. Photographed in 2014. William's new replacement Commonwealth War Graves Commission headstone in Yeovil Cemetery. Photographed in 2016. The Commonwealth War Graves Commission certificate in memory of William Sweet.